Wood pitching for the Cubs in 2008. 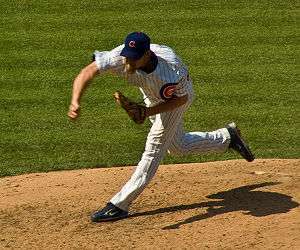 Kerry Lee Wood (born June 16, 1977) is an American former baseball pitcher who played 14 seasons in Major League Baseball (MLB) for the Chicago Cubs, Cleveland Indians, and New York Yankees. Wood first came to prominence as a 20-year-old rookie when he recorded 20 strikeouts in a one-hit shutout against the Houston Astros, which some have argued may be the greatest single-game pitching performance in MLB history. The game also made Wood the co-holder of the MLB record for strikeouts in a single game (20), and earned Wood the nickname Kid K. He was later named the 1998 National League Rookie of the Year. Wood would go on to record over 200 strikeouts in four out of his first five seasons, with a high of 266 in 2003, and holds several MLB strikeout records. In particular, in MLB history, he is second only to Randy Johnson in career strikeouts per nine innings pitched. Though he struggled with injuries throughout his career, Wood was twice named an All-Star. Wood transitioned to a relief pitcher in 2007 due to continued struggles with injuries, ultimately reviving his career as a closer. During his career Wood was placed on the disabled list 14 times in 14 major league seasons, which included missing the entire 1999 season due to Tommy John surgery. After a slow start to the 2012 season, Wood retired on May 18, 2012. Wood attended MacArthur High School in Irving, Texas, for his first three seasons of high school baseball. He continued his education at Grand Prairie High School for his final season as a high school player. The Chicago Cubs drafted Wood as the fourth overall selection in the 1995 Amateur Draft. He spent three years playing in the Minor Leagues. His best season in the Minors came in 1996, when he posted a 10-2 record for the Daytona Cubs. He also played for the Triple-A Iowa Cubs. In 1997, he led all minor league pitchers in walks, with 131. Wood made his first appearance in the Major Leagues on April 12, 1998. In his fifth career start, on May 6, he threw a one-hit, no walk, 20-strikeout shutout against the Houston Astros in Wrigley Field, tying Roger Clemens' record for strikeouts in a nine-inning game and breaking Bill Gullickson's single-game rookie record of 18 strikeouts in 1980. Wood allowed only two baserunners: Ricky Gutiérrez on an infield single and Craig Biggio who was hit by a pitch with a count of two strikes and one ball. (Biggio had led the league in that category each of the previous three years.) Only seven balls reached fair territory. Five were grounders that never left the infield (including Gutierrez's hit), one was a short fly along the right field line, and another was a fly to center. A foul pop was caught by first baseman Mark Grace and the remaining twenty putouts were credited to catcher Sandy Martínez, who caught the entire game. Wood had no special advantages – the Astros went on to lead the league in on-base-percentage, and all of the regulars were in the lineup, including the four who finished the season batting over 300. Not surprisingly, the performance garnered a game score of 105 – the highest number ever calculated for a pitcher in a nine-inning game. Wood finished the 1998 season with a 13–6 record; despite missing the last month of the season with elbow soreness, he easily won the National League Rookie of the Year award. He pitched one game in the playoffs, losing against the Atlanta Braves. During spring training of 1999, Wood underwent Tommy John surgery to repair damage to the ulnar collateral ligament in his right elbow, and missed the entire season. Wood returned in 2000 and struggled to an 8–7 record, but the following season, he returned to form. In 2001, Wood went 12-6 with a 3.36 ERA. The following season, Wood finished 12–11 with a 3.67 ERA, but perhaps more important was the fact he did not miss a start all year long, setting career highs with 213.6 innings pitched and 33 starts. He rang up 217 strikeouts in both seasons. In 2003, Wood continued to improve, setting career highs with 266 strikeouts, 14 wins (as part of a 14–11 record), a 3.20 ERA, and two shutouts. He threw the fastest fastball in the majors among starters, averaging 95.4 miles per hour. He also walked 100 batters and surrendered 24 home runs, also career highs, but was selected as a National League All-Star and helped lead the Cubs to the playoffs as one half of "Chicago Heat" along with fellow pitcher Mark Prior. Wood earned two wins in the Divisional Series against the Atlanta Braves and was the starter in Game 3 of the 2003 National League Championship Series, which the Cubs won in extra innings. However, the Cubs lost in seven games to the eventual World Series champion Florida Marlins. In the decisive Game 7, Wood hit the first home run by a pitcher in an NLCS game since another Cub, Rick Sutcliffe, did so in Game 1 in 1984. However, the Marlins won the game 9-6. Wood was the losing pitcher and the Cubs were eliminated. Wood went 8-9 during the 2004 season and was sidelined for nearly two months with a strained triceps. In 2005, Wood continued to struggle. On August 31, 2005, Wood underwent surgery and missed the remainder of the season. During Spring training in 2006, Wood suffered several injuries which required an additional surgery (on his knee). On May 18, 2006, Wood returned to the Cubs' pitching rotation when he started and lost a home game against the Washington Nationals. In June, Wood returned to the DL with a sore shoulder. The following month, the Cubs announced that Wood had sustained a partially torn rotator cuff which was likely to keep him from pitching again for the rest of the year. At the end of the 2006 season, the Cubs exercised their option on Wood's contract and bought out the remaining $13M. With his long history of injuries and inability to stay in the starting rotation, Wood accepted the Cubs' offer to return as a relief pitcher in 2007. Wood attempted to sustain a regular throwing schedule and appearances during Spring training games. However, Wood was placed on the 15-day DL with soreness in his elbow and was then moved to the 60-day DL. Wood considered retiring if he continued to have pain in his throwing arm. He began playing catch on May 21. In his first rehab assignment in Cubs Rookie Ball, he struck out all three batters he faced. On July 24, he pitched 1 inning with the Single-A Peoria Chiefs, throwing 9 pitches. He made back-to-back appearances on July 26 and July 27, throwing his fastball between 92-94 mph with no discomfort. The Cubs activated Wood from the 60-Day Disabled List on August 3, causing many to believe that he would make his actual return on that day. In the seventh inning, however, Lou Piniella opted to send Bob Howry to the mound, and most fans, eager to see Kerry back on the hill, mistakenly gave Howry a standing ovation, only to realize moments later it was actually not Wood. Piniella later stated he wanted Wood to receive a "softer landing", or in other words, make his return in a game where the Cubs have a comfortable lead over their opponents. Wood made his return on August 5, with the Cubs trailing the New York Mets by four runs. He pitched a single inning, during which he allowed one hit, and struck out another batter. Piniella praised Wood's performance, stating "He threw the ball real good", and "His breaking ball had some bite to it, and he threw it up there about 93-94, about what we expected". He remained healthy appearing in 22 games and posting a 1-1 record with a solid 3.33 ERA. He was generally limited to one inning per outing, not appearing in games on back to back days, though he did pitch in both halves of a double header on September 15. Wood was a major contributor to the Cubs' NL Central Division Championship down the stretch in late September, earning a win and 8 holds. Wood filed for free-agency on November 11, 2007, though he suggested that he wanted to remain in pinstripes for the 2008 season. Despite multi-year offers from other teams, Wood agreed to a one-year, $4.2 million deal with the Cubs. Wood, along with Bob Howry and Carlos Mármol, competed for the role as the Cubs' closer after Ryan Dempster was moved to the starting rotation. After posting a 2.84 ERA in the spring, Wood won the job. He recorded his first career save April 3, 2008 with a win over the Brewers. Wood recorded 34 saves in 39 opportunities, 82 strike-outs and a 1.12 WHIP. He was selected to the 2008 MLB All-Star Game as a relief pitcher on July 6, 2008 along with six other teammates. Wood was placed on the 15-day DL on July 24, 2008 with a blister on his right index finger. On November 13, 2008, after acquiring closer Kevin Gregg from the Florida Marlins, Cubs general manager Jim Hendry announced that the organization did not plan to re-sign Wood. He had previously requested a multi-year contract with the team, but was deferred due to financial reasons. Wood stated he wished to remain with the Cubs, but also wanted to continue playing baseball. Wood pitching for the Cleveland Indians in 2010. On December 13, 2008, Wood signed a two-year contract with the Cleveland Indians. Cubs fans showed their appreciation for him by giving him a standing ovation when the Cleveland Indians played at Wrigley Field on June 19, 2009. During the 2010 season, Wood was placed on the disabled list until May 8 due to an upper back muscle strain. On July 17, 2010, Wood was placed on the disabled list for the 14th time in his major league career, this time due to a blister on his right index finger. Wood was traded from the Cleveland Indians to the New York Yankees on July 31, 2010 for Andrew Shive, Matt Cusick, and cash. With the Yankees, he went 2-0 with a 0.69 ERA in 24 games, including 21 straight scoreless appearances, and served as the bridge to Mariano Rivera in the 2010 postseason. During the 2010 postseason, Wood had a 2.25 ERA appearing in 7 games overall. The Yankees won the 2010 ALDS against the Minnesota Twins in 3 games but lost to the Texas Rangers in 6 games of the 2010 ALCS. The Yankees announced on October 27 that the club had declined to exercise their option for Wood for 2011. On December 16, 2010, Wood agreed to a one-year deal worth $1.5 million with the Cubs. Wood reportedly turned down offers for long-term deals from several other teams worth more money due to his desire to keep his family in Chicago. Wood re-signed with the Cubs on January 13, 2012 for a 1-year, $3 million deal with a team option for 2013. On May 18, 2012, Wood retired, striking out the only (and therefore final) batter he faced, Dayán Viciedo of the Chicago White Sox. The fans at Wrigley Field gave Wood a long standing ovation as his son, Justin, ran out to greet him as he exited the field. On his baseball career: "I had fun, I had a blast", Wood said. "I wouldn't trade anything in." Wood is married to Sarah Pates of Waukegan, Illinois. The couple has one son, Justin, and two daughters, Katie and Charlotte. Until 2008, the family resided in the Old Town neighborhood of Chicago. While playing for the Cubs, the Woods hosted a celebrity bowling tournament called Kerry Wood's Strike Zone, which also featured a silent auction that raised over two million dollars. On June 24, 2013, while paddleboarding in waters near Chicago, Wood happened upon a corpse floating in Belmont Harbor. He immediately reported the discovery to local authorities, who determined the deceased to be a 40-year-old man who had been reported missing by a North Side nursing home days earlier. 1 2 3 4 5 6 7 "Kerry Wood Stats, Video Highlights, Photos, Bio". mlb.com. Retrieved 2012-05-18. ↑ "The Official Site of The Chicago Cubs: Team: Player Information : Biography and Career Highlights". Chicago.cubs.mlb.com. Retrieved 2010-11-21. 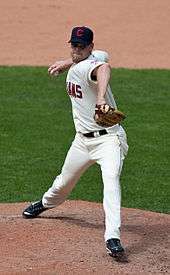 1 2 "Kerry Wood – Pitching Statistics". The Baseball Cube. Retrieved August 5, 2007. ↑ "Batting Leaders – Baseball-Reference.com". Minors.baseball-reference.com. Retrieved 2010-11-21. ↑ Bissinger, Buzz (June 3, 2007). "My Right Arm". The New York Times. Retrieved May 7, 2010. ↑ "Wednesday, May 6, 1998, 1:20, Wrigley Field". baseball-reference.com. May 6, 1998. Retrieved May 13, 2013. ↑ "Major League Leaderboards » 2003 » Pitchers » Pitch Type Statistics | FanGraphs Baseball". Fangraphs.com. Retrieved 2010-11-21. ↑ Muskat Carrie. "Wood determined to get back on mound". MLB.com. Retrieved 2012-05-18. 1 2 Costa, Brian (2010-10-22). "The Long Walk From Chicago". Wall Street Journal. Retrieved 2010-11-21. ↑ Muskat Carrie. "Wood starts in third outing for Peoria". MLB.com. Retrieved 2012-05-18. ↑ Muskat, Carrie (2007-08-01). "Wood likely to return on Friday". MLB.com. Retrieved 2007-08-02. ↑ Gano, Rick (August 3, 2007). "NY Mets 6, Chi Cubs 2". Yahoo! Sports. Retrieved August 3, 2007. ↑ Ladewski, Paul (2007-08-04). "Wood waiting in wings". Daily Southtown. Retrieved 2007-08-04. 1 2 "Kerry Wood returns, pitches a scoreless inning for Cubs against Mets". SI.com. Associated Press. 2007-08-05. Retrieved 2007-08-05. ↑ Sullivan, Paul (2007-08-06). "Kerry Wood back in the fray". Chicago Tribune. Retrieved 2007-08-06. 1 2 Muskat, Carrie (2007-11-26). "Wood to return with Cubs in 2008". MLB.com. Retrieved 2007-11-26. ↑ "Closing time: Wood makes strong bid for closer role in Cubs' 7-3 victory over Padres – MLB – Yahoo! Sports". Sports.yahoo.com. 2010-11-17. Retrieved 2010-11-21. ↑ Muskat, Carrie (2008-03-23). "Cubs set to announce pitching choices | cubs.com: News". MLB.com. Chicago.cubs.mlb.com. Retrieved 2010-11-21. ↑ "Four Red Sox, three Cubs to start in 2008 All-Star Game". ESPN. Associated Press. 2008-07-07. Retrieved 2008-08-02. ↑ Muskat, Carrie (2008-07-27). "Wood's blister problem remains". mlb.com. Retrieved 2008-08-02. ↑ Sullivan, Paul (2008-11-13). "Cubs say goodbye to Kerry Wood". chicagobreakingnews.com. Retrieved 2009-07-20. ↑ "Wood credits Cubs GM Hendry's honesty, but said leaving the team was 'bittersweet'". ESPN. Associated Press. 2008-11-14. Retrieved 2009-07-20. ↑ "Indians sign free agent RHP Wood" (Press release). Cleveland.indians.mlb.com. 2008-12-13. Retrieved 2010-11-21. ↑ Temple, Jesse (2009-06-19). "Wood, DeRosa return to Wrigley Field | cubs.com: News". MLB.com. Chicago.cubs.mlb.com. Retrieved 2010-11-21. 1 2 "Indians activate Wood from disabled list | indians.com: News". Retrieved 2012-05-18. ↑ "Kerry Wood Statistics and History". Baseball-Reference.com. Retrieved 2010-11-21. ↑ Hoch, Bryan (10 October 2010). "Yanks use Wood to build sturdy bridge to Mo". mlb.com. Retrieved 2012-05-18. ↑ "Yankees decline to pick up Kerry Wood's option". Chicago Breaking Sports. 2010-10-27. Retrieved 2010-11-21. ↑ "Cubs bring Wood back with one-year deal | cubs.com: News". Retrieved 2012-05-18. ↑ "Cubs, Wood agree to one-year deal". cubs.com. 2010-12-17. Retrieved 2010-12-17. ↑ "Chicago – Chicago : News : Politics : Things To Do : Sports". Chicago Sun-Times. ↑ Muskat, Carrie (May 18, 2012). "Wood retires after final outing". MLB.com. Retrieved 18 May 2012. ↑ "JockBio: Kerry Wood Biography". jockbio.com. Black Book Partners. 2004. Retrieved 2009-07-20. ↑ Muskat, Carrie (2006-02-13). "Mailbag: Wood growing strong again". mlb.com. ↑ Rodkin, Dennis (2008-02-20). "Housing Bulletin—Kerry Wood Takes a Loss". Chicago Magazine. Retrieved 2009-07-20. ↑ Muskat, Carrie (2005-11-08). "Unique items available for Wood auction". mlb.com. Retrieved 2009-07-20. ↑ Mitchell, Fred (2006-05-25). "Guillen, Ditka are 2 of a kind". Chicago Tribune. Retrieved 2009-07-20. ↑ Snyder, Matt (2013-06-25). "Report: Kerry Wood discovered a dead body Monday". cbssports.com. Retrieved 2013-06-26. Wikimedia Commons has media related to Kerry Wood.